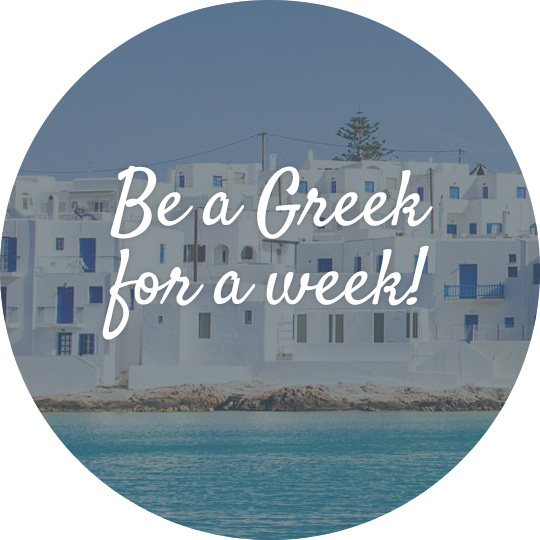 “Be a Greek for a week” is a 6-day full language immersion retreat in Paros, Greece, specially designed for Greek language learners of all levels who are hooked on the Greek language and want to visit Greece with a focus on learning the language. Who are excited to work and spend time with a native certified Greek language coach, who will customize their learning, respecting their specific language skills and needs. 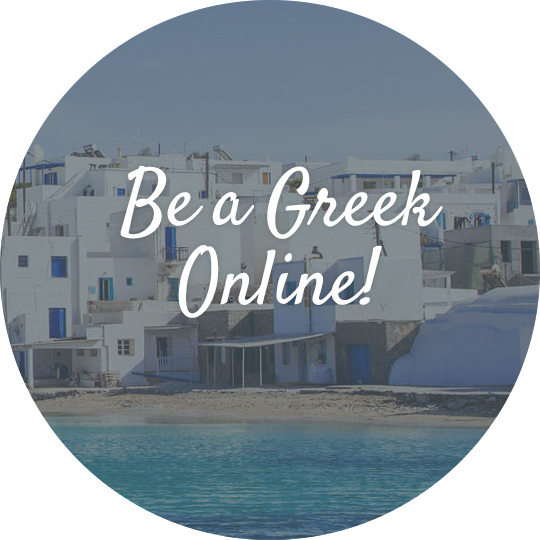 “Be a Greek for 2 weeks” is a 12-day full language immersion retreat in Paros, Greece. Get one more week of Greek lessons as well as more activities, workshops and seminars. Speak, cook, hike, dance, sing and taste! Dive into the Greek language and culture, and surround yourself by the beauty of Paros island! The retreat is over and you have to go back home! But you want to continue practice in Greek! No worries! Just book your online course of modern Greek and enjoy your greek dose in winter time till summer and the next retreat back in Paros! “Be a Greek for a week” language retreat starts every Sunday-arrival day, with the welcoming dinner. The first week, ends on Friday with the cooking lesson, where we learn how to cook a traditional Greek recipe and of course enjoying and sharing all together a home made meal! The second week ends with an all-day boat trip to Antiparos. You have the possibility to attend a 1 or 2 week course. If you choose the 1 week course, you’ll miss half the fun, but we understand… In this case you will join in the first week of any 2-week course or the only 1-week retreat in Easter and May. To make this more clear for you, here are all the dates from April till October! Choose the time that fits you best and send me a message! I’ll be happy to help you! A Welcoming dinner on the day of the arrival, Sunday, at a traditional Greek taverna. Lets meet up and chat! Two hour morning lessons (with a 10min break) from Monday till Friday with a certified Greek language tutor, native in Greek. After the lesson you have the opportunity, both to practice with native speakers, in real life situations what you have learned in class and lots of free time to enjoy yourself with your family and friends. After all, you are on holidays in Paros, right? A guided tour of the capital city of Paros, Paroikia. Experience the urban landscape of Paros. Ancient, Byzantine and modern history and architecture of Paroikia, the biggest capital of the Cyclades. A walk through the countryside down the old Byzantine Road and a visit at the museum of folklore of Lefkes. 2 Traditional Greek dance lessons focusing of course on the local Parian dances! One more week of the morning language lessons to take your Greek to the next level! A walk at the Environmental Park of Paros, a unique ecological sanctuary in the Cyclades plus a visit to the historic exhibition at the renovated monk cells of Ai Yiannis Detis monastery. “Sing your Greek heart out” a singing workshop where we practice pronunciation, intonation, learn new vocabulary while we sing Greek songs. An all day boat trip to the nearby island of Antiparos! Swimming, snorkeling, music, including food and drinks! A farewell meze aperitivo on the last day of the retreat! During the evening activities and workshops your friends and family are all welcome to join in paying of course the equivalent fee! For the outdoor activities and the boat trips that are dependent on the weather, there may be a change of schedule, basically because we want to make sure that you enjoy and get the most out of your trekking and boat sunset trip! The price DOES NOT include airfare, boat tickets to and from Paros, accommodation and getting around in Paros. We can give you advice about places to stay and transport options. In order to ensure individual attention, i make sure that classes are kept to a maximum of 4 students. Mini groups work, stuffy classrooms don’t! Ready to be a Greek for a week? Send me a message with the dates you would like and I’ll get in touch to discuss the details. 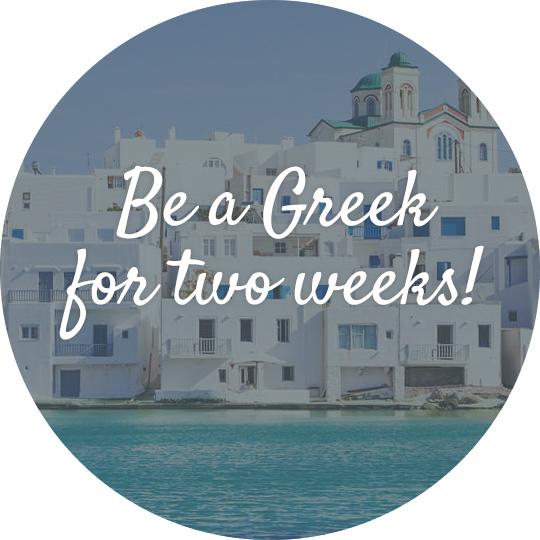 You were all set to “Be a Greek for a week”…and then something got in the way? If you do need to cancel we completely understand, after all things happen. However please be aware that we don’t offer refunds, and that’s because we have to pay the people who will be teaching and organising events for us whether you are there or not. But here’s what we can do: if there are places available we will try to transfer you to another course.